... Francis Ahinful Takes over the Presidency Mr. Francis Ahinful, a Ghanaian Community Businessman has assumed the Presidency of the Ghanaian Community in Toronto. After years of administrative setbacks and flaws, The Ghana Union of Toronto, the Umbrella Organization of the Ghanaian Community in Toronto is bouncing back to life with the election of a new Executive Committee. 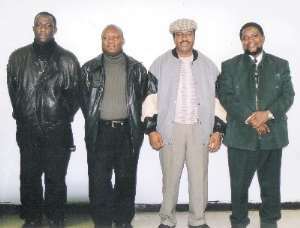 From Left, Joseph Ntow-Duku - Secretary, Francis Ahinful -President, David Dickson -Treasurer, and James Blankson -Vice-President The elections were held at the Humber Sheppard Community Recreation Center on the 29th of January 2005. Arhinful was returned unopposed after his challenger Dr. Victor Awafo withdrew from the contest before voting began. The candidates for the positions of Secretary Joseph Duku Ntow and Treasurer David Dickson were returned unopposed. The nominees for the Presidency and Vice Presidency faced a barrage of questions from members of the Electoral Commission led by Mr. Daniel Abassah who also acted as a Vetting Committee. They grilled the candidates, Francis Ahinful and James Blankson for the Presidency and Vice Presidency respectively to test their integrity and tried to unearth any misconduct, which will stand in the way of their leadership. Prince Gbeklui and Samuel Yirekyi voluntarily withdrew their candidacies for the position of Vice President before the vote. James Blankson was finally declared elected as the Vice with 41 votes beating Sam Aboagye Danso (contesting in abstentia ) to second place with 29 votes. The election to the position of Assistant Secretary was put on hold as the only candidate who had filed his papers for the election did not show up. The new President, Mr. Francis Ahinful is a private businessman who runs Blessing Tropical Foods Inc. in Toronto that deals with the importation of tropical foodstuffs. He is also a part time Para-Legal Consultant. He is married to Cecilia Kwetena and the couple have 5 children. Mr. Owusu Afriyei alias "Okomo", a member of the Electoral Committee told The Ghanaian News in a brief interview that "so far everything has gone well with a good turn out and the questions asked by the audience and the Electoral committee reflected what the community wants to know". Other members on the Electoral Committee are Daniel Abassah, John Anati, Baffuor Awuah and Elizabeth Raji. The Ghanaian Consul General in Toronto, Nana Opoku Boahen was one of the dignitaries who were present to vote.